Enroll here with your email address or Facebook account. After you register you’ll get a Schlotzsky’s coupon for a free small Original® sandwich. 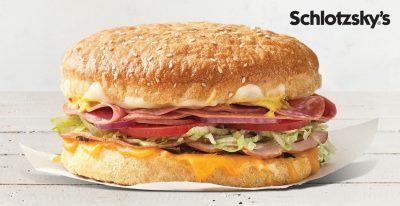 Schlotzsky’s is a privately held franchise chain of restaurants, specializing in sandwiches. The company is headquartered in Atlanta, Georgia. Schlotzsky’s has more than 350 franchised and company-owned locations worldwide. Most locations are in the south and southwestern United States, but the company is expanding into areas across the country, particularly the north and southeast.